Back then, the audio powerhouse (publicly at least) was still focused on Dolby Surround 7.1. A trawl of the archives finds Dolby promoting the releases of movies such as Mission: Impossible – Ghost Protocol, and the Chemical Brothers concert film Don’t Think, in its extended but still resolutely channel-based format. And remember that this itself had only debuted in 2010 with Pixar’s Toy Story 3. Then came April 23, 2012, where under the seemingly hyperbolic headline ‘Dolby Atmos isthe future of Entertainment Sound,’ the company revealed a new sonic invention. Dolby Atmos rolled out to a happy few multiplexes just a few weeks later with another Pixar title – Brave. The remarkable rise of Atmos had begun. 2017, and you can’t move for Dolby Atmos. 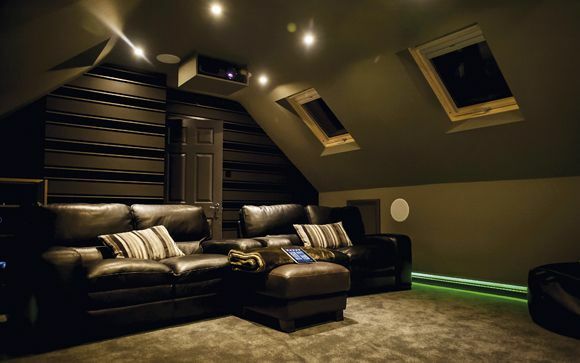 Certainly if you’re a signed-up member of Club Home Cinema, but even on a wider, mass-market consumer tech level, it’s become increasingly prevalent. Consider the evidence: just recently, BT added Dolby Atmos audio to its Ultra HD football transmissions; console games are sporting Atmos mixes; even TVs, from LG, are coming with Atmos capabilities in-built. It’s not reached the level of pub debate, of course, but it’d be difficult to argue that it hasn’t been successful. What’s the secret of its success, though? And what to consider if you’ve yet to upgrade your system to support it? To start with, a quick recap. Dolby Atmos differs from the company’s predecessor formats in its employment of sound objects. Whereas a film used to be mixed and encoded in, for instance, 5.1, with audio tied to specific channels, it’s now produced, simply, in Dolby Atmos. Thinking in terms of channels is out; thinking in terms of objects (dialogue, a car engine, a bass drum...) is in. Sound designers decide where objects (up to a total of 118) sit and move within a hemispherical soundfield. Dolby's processor hardware then disentangles the metadata to map the object-based soundmix to a speaker array. In a commercial cinema, such a system could include dozens of speakers. Dolby's own screening theatre in London's Soho Square employs 36. It's easy to see why Atmos has gained traction with content creators. It provides for greater flexibility and precision for effects steering, and – with height speakers a key part of the package – adds three-dimensionality. Want a helicopter to land on your audience? No problem. I visited Dolby back in the Summer of 2014. There, company 'Evangelist' Jonathan Jowitt enthused about the impact the format had had in just a couple of years. 'It's the most successful cinema technology we've had,' he told me. More than 120 films with Atmos soundmixes had been released by then into 650 cinemas – of the latter, there are now four times as many worldwide. 'Feedback from cinemagoers has been brilliant,' said Jowitt at the time. 'They talk about being immersed in the action.' The next step was to bring that immersion into the home. Dolby Atmos at your multiplex and in your home are two different beasts. They have to be. Put it bluntly, you can't afford the speaker rig and hardware stack to do justice to all those sound objects. Yet Dolby wanted to get more mileage out of its new toy, and studios wanted to make the most of those new mixes that adorned their films, so a solution was engineered. Dolby prepped a scalable algorithm and introduced spatial decoding, allowing its existing Dolby TrueHD (and Dolby Digital Plus) codecs to carry Dolby Atmos information. Fed into Dolby Atmos-decoding hardware (an AV receiver or processor), the bitstream audio is then mapped to the speaker array of the setup. For the home, Dolby says such a system could include as many as 24 surround speakers and ten overheads. Unsurprisingly, the AV industry has mostly settled on more manageable home setups, using two or four overhead speakers atop a traditional five- or seven-channel base layer. And it's this downscaled Atmos (literally) that has captured the imagination of home enthusiasts. All that's needed to enjoy it is a capable AV receiver and either overhead speakers or Dolby Atmos-enabled upfirers. The latter have been Dolby's secret weapon – a quick retort to the obvious cry of 'I can't attach speakers to my ceiling!'. Again, I first heard a set in 2014 at Dolby's HQ, in this case KEF prototypes that would eventually evolve into its R50 models. Differences in demonstrations between upfirers and overheads were at times hard to discern, and in the real-world, where you're unlikely to be able to play spot the difference, upfirers have proved good enough to make a real impact, using angled drivers and a Dolby-described notch filter to replicate the characteristics of overhead audio. And they're designed to slot into a current setup as discreetly as possible. If your system environment precludes fitting ceiling speakers, these are your friend. The market, however, does remain small. KEF's R50s joined Onkyo's affordable SKH-410s, and buying options have since been bolstered by models from PSB and ELAC, plus integrated floorstanders from Definitive Technology and Pioneer. Yet marquee brands, including the likes of Bowers & Wilkins and Monitor Audio, have given them a wide berth. For physical ceiling speakers, there's a larger range to choose from. Go in-ceiling and you'll find prices are tempting, as there's no cabinet to factor into the equation. However, this requires an installation that involves altering your ceiling. A less sleek and more expensive option is to fit traditional loudspeakers up high, perhaps going for a shallow cabinet to minimise aesthetic disruption. In both instances, look for speakers that claim a wide dispersion and – if possible – are timbre-matched to your existing setup. When it comes to AV receivers the world is your object-based oyster. It's increasingly difficult to find any AV receiver above around £450 that doesn't decode Dolby Atmos. Shop with brands Onkyo, Denon, Yamaha, Marantz, Pioneer, Arcam and Anthem and you're in safe hands. There are factors to consider when it comes to upgrading to Atmos, of course. The soundstage sounds at its best when four overhead/upfirers are employed, as this gives greater emphasis and fluidity to the height elements that sound engineers regularly employ. At the same time, your setup also sounds at its best with rear back channels (numbers 6 and 7, if you like, in a 7.1 array) in play. This obviously equates to a system that needs 11 channels of power, which limits AVR choice considerably, or has you hunting around for another stereo amp. Choose nine-channel hardware and you're faced with another choice – four up top and lose the rear backs, or maintain 7.1 with only two height speakers. HCC's suggestion would be to stick with whatever system you've been employing pre-Atmos, and add just two heights if budget/room/available kit limits you to that. Those running 5.1 should perhaps go straight for 5.1.4 – there's no doubt a reason that rear backs haven't been added already. And, as always with audio, setup and EQ is important. Stick as close as you can to Dolby's guidelines, run your AVR's auto-calibration routine and listen critically – Dolby's short trailers available on its demo disc (particularly Leaf) are good tools for evaluation, particularly if you want to move the position of upfirers. You may find you prefer to run the Atmos channels a little 'hot' to get greater height impact. It's a matter of personal taste. Not running a traditional AV setup? Atmos is being aimed at you, too. The massive soundbar market has seen brands innovating with upfiring units to deliver 3D audio from more living-room friendly enclosures. Our current favourites, though, are pricey – Yamaha's £1,500 YSP-5600 that employs 44 separate beam drivers in a single unit, and Samsung's £1,300 HW-K950 that adds wireless rears speakers to its soundbar. More affordable options from Philips and Onkyo are inbound. Dolby Atmos in home cinemas would be almost pointless without software (I say 'almost', as Dolby Surround upmixing, which remaps regular film soundtracks to your Atmos array, can be effective).Thankfully, studio support for the format has been reasonably strong, growing from a small slate of early releases to a wider selection that includes plenty of cinema's box office big hitters. Yet some studios are still turning a blind eye (or ear), or using Atmos exclusively with 4K discs. At first we kept a keen eye out for Atmos titles (which began with Transformers: Age of Extinction in 2014), but now we're more likely to notice if a major title is shipped with a traditional 'flat' mix when it had an Atmos soundtrack for its commercial release. To date, this situation still arises with all Disney Blu-ray releases – The Jungle Book and Star Wars: The Force Awakens are two notable 2016 discs that featured DTS-HD MA. And then there are both Sony Pictures and Twentieth Century Fox – the former has taken to issuing Ultra HD Blu-ray releases that see Atmos accompanying the 4K feature but stick with a flat mix for the 1080p title (Concussion, Inferno and The Magnificent Seven are recent examples). Fox has been even more hit and miss, releasing The Revenant with a DTS-HD soundtrack (despite being released in Atmos in cinemas) on all Blu-ray variants, but including an Atmos encode on its 4K release of Deadpool. Essentially, if you're buying discs with Atmos in mind, it pays to research before you add a title to your shopping basket. When does Atmos work well? Pretty much all the time, really. Movies such as Mad Max: Fury Road, Gravity and Transformers: Age of Extinction are obvious flag-bearers for the format, courtesy of their show-stopping set-pieces and overhead antics. Yet we've also been dazzled more recently by lower-budget titles making effective use of 3D sound design, particularly horror titles Blair Witch and The Conjuring 2. And we've even found ourselves sitting through absolute clunkers (The Gunman, for instance), still being tickled by the audio invention. In five years from now, Dolby Atmos will no doubt still be here. Too much time, money and sonic know-how has been invested for the tech to be thrown away, and everyone from sound designers to film enthusiasts are reaping the rewards. You can expect to see it expanding its user base as more soundbars, TVs and set-top boxes carry the decoding silicon, and more content creators, including game studios and streaming giants, get involved. And you can expect it to remain a staple of theatrical releases, particularly with Dolby pushing its Atmos+HDR Dolby Vision format. And when it comes to home cinema, we can hope that eventually Disney and Fox alter their strategies, to the point where Atmos mixes on major BD releases are a given. If that happens, then Dolby would be justified in calling its format the 'Future of Entertainment Sound'. A double-dip release that was worth it, as it replaced the original DTS-HD 5.1 mix with an Atmos track (the film scooped awards for its sound design and was released in cinemas in Atmos). The result is remarkable, particularly when it comes to the circular pans and localised dialogue that are peppered around the hemispherical soundstage. Sound (or lack of it) is a vital component of Gravity – get the best reproduction you can. The Wachowski siblings' bonkers fantasy sci-fi starring Mila Kunis and Channing Tatum packs an expansive, dynamic Dolby Atmos mix to take your mind off the onscreen CG lunacy, especially when it comes to pushing Michael Giacchino's score right up into the rafters and down again. It's akin to being thrust headfirst into an orchestra. Last year's sequel may still go low-fi on the found-footage visuals, but its Atmos soundtrack is pristine. The main job it's given here is to terrify the audience, and through cleverly localised effects and spooky atmospherics it succeeds in spades once the night-time horror commences. A fine example of how to create hair-raising tension through inventive sound design. Dollops of LFE help, too. The throaty roars of various overhauled car engines are a near constant in George Miller's outback dystopia, and on Warner's Blu-ray they snarl and thrust through your cinema room practically flicking sand in your face. But there's more to this demo-worthy Atmos track than just petrol-head chaos – quieter moments are still packed with attention to detail. Surround sound subtlety isn't the order of the day in this battle-bot sequel – audio engineer Erik Aadahl was clearly given instruction to push everything to the max and make full use of the Atmos play-pen. The result is full-bodied overhead effects that create a massive sense of scale, with metallic objects clanking all around, sharp and heavy and backed up by bruising bass. Breathtaking from start to finish. What's there to hear on top of the world? In this case, ice-cold winds whipping all around you, bassy cracks as layers of ice rip apart, Dario Marianelli's haunting, dramatic score and the desperate breaths of courageous climbers. Everest's Blu-ray and UHD Blu-ray releases pack all this into an Atmos mix that oozes clarity, depth and dynamism. Scarlett Johansson's action-fuelled sci-fi enjoyed a superb UHD release in 2016, with a new Dolby Atmos mix coming as a welcome bonus after the initial Blu-ray outing shipped with DTS-HD MA 5.1. Visually, Lucy is a film that zips and glides all over the place, and the soundmix follows its lead, placing you amidst a soundfield that extends in all directions– and that includes the thumping score. A playful, home cinema head-turner. Bang, bang. Slice, dice. Punch, kick. This Keanu Reeves vehicle offers some of the most brutally visceral sound effects work we can remember, and the Blu-ray's Atmos track works tirelessly to give these details a place in the soundstage and gut-wrenching impact. It's lean, mean and precise, rather like its titular hero. Released in 2015 by Sony Pictures as a 'Mastered in 4K' edition (but still Full HD resolution), this is a Region A-locked US platter that's worth importing if your system supports it, as it upgrades the already reference-grade soundmix to Dolby Atmos with predictably joyous results. Note, though, that a genuine UHD release is scheduled to launch in the US this Summer, which we imagine will carry the same track.